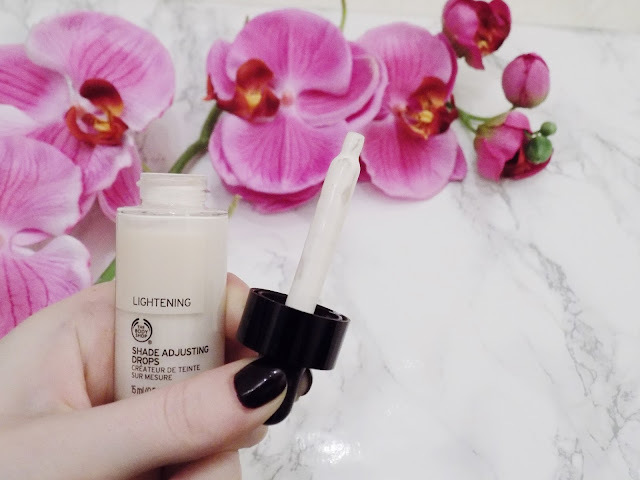 Today is a review on the new Lightening Shade Adjusting Drops from The Body Shop. They have recently been launched and have filled a massive hole in the foundation game, for me at least. So I thought I would get my review up as quick as possible and tell you my thoughts on the concept and performance. I have pretty fair skin so I was so excited and intrigued when The Body Shop released their Shade Adjusting Drops. They have lightening ones which is what I got, (obvs) and they also have darkening drops which I am wanting to try to see if I can mix it to do a cream contour type thing? But for now I've been trying the lightening drops and I am so excited and pleased with how they work. My perfect match foundation is the NARS foundations but now every foundation can match my skin tone. Tip: The Lightening drops can only be used to lighten light to medium foundation shades. So if you have light to medium skin tone and the new foundation you've just purchased is too dark (and can't exchange it or take it back) or it's the middle of winter and your foundation is now too dark for you, these lightening drops are exactly what you need. Simply add one drop to get 1/2 a shade lighter. 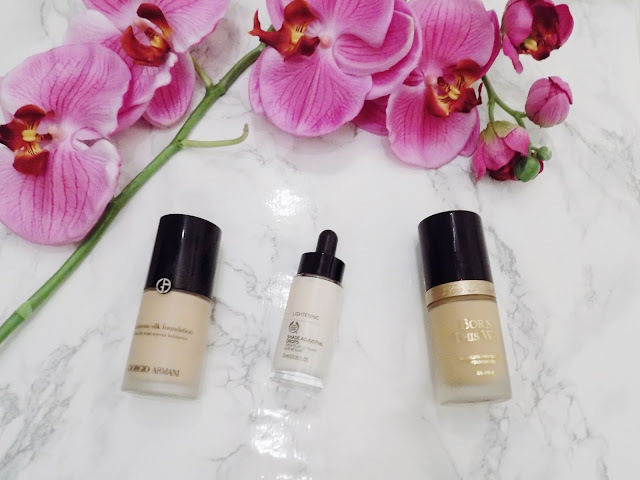 (I use 3 with my Giorgio Armani Luminous Silk Foundation which is shade 2 - which is the first foundation I tried these with as I love it). You can customise your foundation shade to suit you and whatever the reason is, it's a life saver and keeps you from wasting your money as you can still use your dark foundations, simply add some of this in. Some may think that this is a faff. "Why not get the right shade" they may ask. Well for me who is as white as a ghost, I don't have many foundations that perfectly match my skin tone so finding the right shade for me is 98% impossible. I would prefer to have an extra step and have to mix something in to my foundation than have my foundation make my face a completely different colour to the rest of my body - it's not a good look let's be honest. 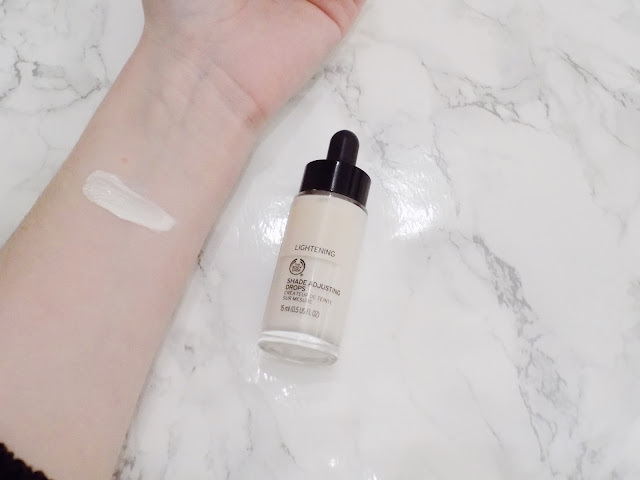 They say this works with most liquid foundations, and these are the two main ones I've been using the lightening drops with as these are about 2-3 shades darker which means I do have to use quite a few drops to get my perfect shade. But it also works well with cream foundations like these two which are my favourite more fuller coverage foundations. What I find is truly great about these drops is that it customizes your shade whilst still keeping the coverage, texture, finish etc. of the original foundation. 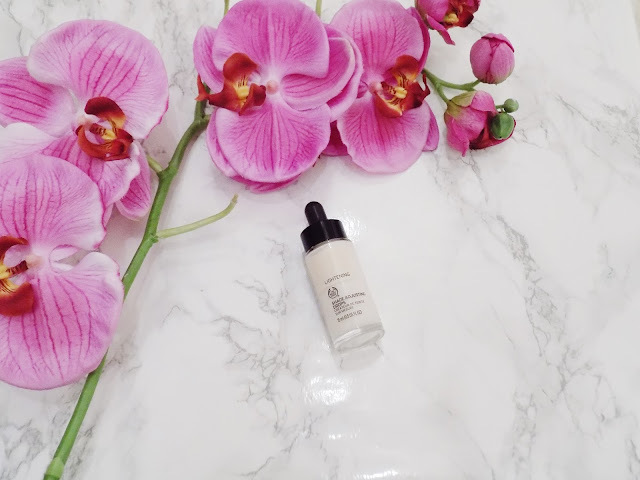 Plus, it's only £10.00 and that with the concentration of white and pink pigments in those little drops of heaven it's my favourite tool in my makeup collection. Packaging: 9/10 The packaging is glass with a little dropper so not perfect for travel but is the best way to use them as only need a drop or so. But would be more convenient if in a plastic bottle. Performance: 10/10 Doesn't change the performance of the other products, literally just changes the shade. Shade: 10/10 It's the perfect amount of neutral to be suitable for any tone of foundation. Fair skin gals will finally have their perfect foundation match. Price: 10/10 A tenner? Really? 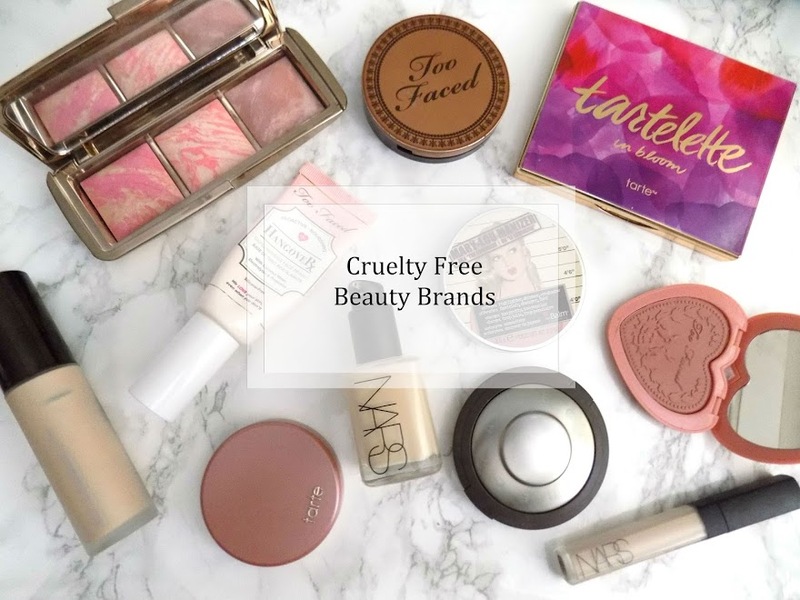 Such a great price, You barely use any so will last forever and it's The Body Shop so you know it's good quality and that they have good values. Availability: 9/10 Not as available as drugstore products but you can buy online or in stores. Not sure if launched in other countries yet though. Concept: 10/10 Fantastic idea, great product, 100% perfect concept. I love this product, in case you couldn't tell. I think it's such an incredible concept and I love that it doesn't change the product you're mixing it with like the coverage, finish or texture etc. Definitely a 10/10 for me. 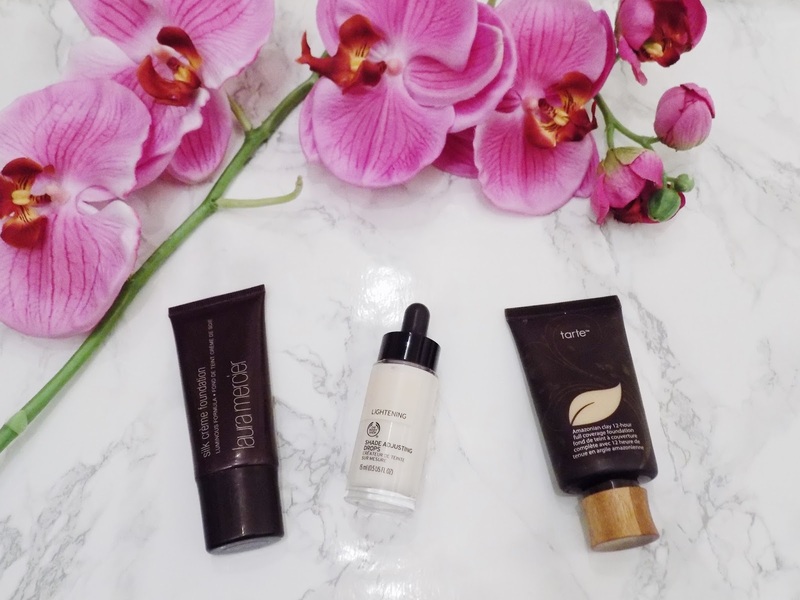 Have you tried these Shade Adjusting Drops yet? **Disclaimer - I am not being paid to write this review, there are no affiliate links included so I don't get any commission if you click on the links in this review. All opinions are 100% honest and my own. I'm really interested in these but more so the darkening ones as its summer here in Australia and I have a few foundations that are a tad light. I hope they are released here soon! Well The Body Shop says the darkening drops can only be used on deep to dark foundation shades, because of the tones they have in the drops, so I don't know how well it would work on lighter foundations. But let me know how it goes if you do end up getting them.